Means that the file was recorder at 2016/12/02 14:55:51 UTC with center frequency in 1691 MHz and Sample rate of 1.25MHz. That’s basically the main signal for the end user. It provides more data than EMWIN (almost everything that the satellite can give is broadcasted here) and with higher resolution. It also provides full disk images of the earth in Infrared, Visible and Water Vapour. It is decodable using a 1.5m prime focus dish (or 1.2m offset dish) with a good feed. I have some samples with my 1.9m dish and 2.2m dish. Both are good enough to decode and no RS Errors at most of the time. 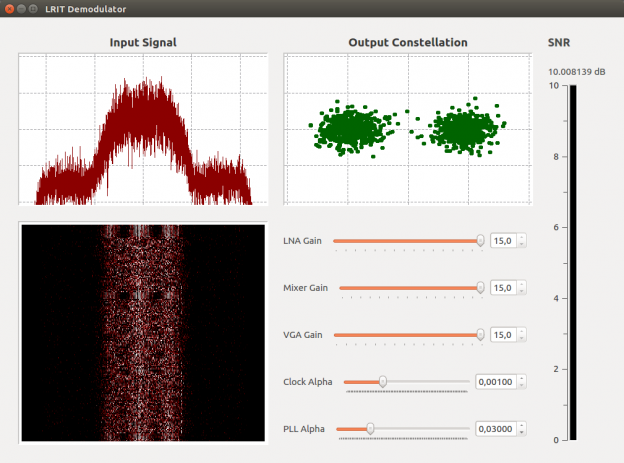 The signal is modulated using BPSK with 293883 symbols / sec with CCSDS Standard Framing. That’s the easiest signal to catch on GOES satellites. Its a low bandwidth signal that is easily picked up even with a 90cm dish (maybe even less). It doesn’t transmit much data and doesn’t transmit full disk images. It is modulated using OQPSK. This is a rebroadcast from the Data Collection System (DCS). In the L Band (the recordings) its actually a translation repeater that gets a portion of the UHF Band and repeats in the L Band. The DCS Stations are in ground and sends all sets of data to the satellite using very directional yagis. I have basically no much info about it but feel free to test it. GOES-16 is the next generation of GOES Satellites. At the time I’m writing this the satellite is still under test. For now all these samples should be treated as Test Data and may not reflect on the signals that will be on air when it gets out of the test phase. That’s the telemetry of GOES-16 Satellite. The Telemetry content is unknown so far, but the modulation is BPSK at 40ksps.